This is brand new title from the Topz series for 7-11 year olds. Sarah likes to imagine what it would have been like to have lived in the time of Jesus in the Bible. What must it have been like to see Jesus face to face? She imagines that the whole Topz Gang are back in Bible times. They play games with the children of Jesus' time, explore the area where Jesus lived, and listen to Jesus as He tells stories to the crowds. 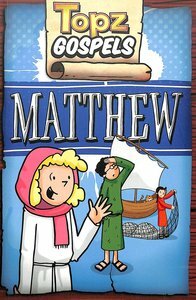 Best of all, the Gang get to witness some very special miracles and learn the meaning behind some of their favourite stories from the Gospel of Matthew in the Bible.